If you’re an athlete, you probably know the discomfort of a stress fracture all too well. It’s a common sports-related injury, especially for runners. But an untreated stress fracture can do more than cause pain; it could end your competition days completely. Sports injury doctor and podiatric surgeon Holli Alster of the Family Foot & Ankle Center of Central Jersey can help. She’s a Board Certified foot and ankle surgeon who specializes in injuries below the knee. If you have or think you may have a stress fracture, it’s time to give us a call. Sesmoiditis. There are two sesmoids in your foot, located underneath the big toe. When they fracture, or the tendons around them become inflamed, you may experience pain or the inability to stretch your toes. It’s similar to runner’s knee, which affects the sesmoid in your knee joint. Shin splints. Shin splints are caused by small tears in your leg muscles, and are common in runners. 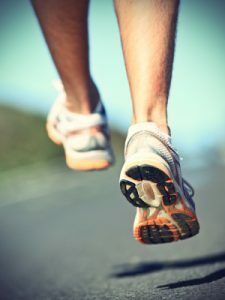 They’re often caused by overworking the leg muscles, poor running shoes or imbalanced running, such as running on the balls of your feet or toes only. Heel pain. Heel spurs, plantar fasciitis and stress fractures can all contribute to heel pain. It’s important to see a doctor if you injure your heel, since your non-surgical options may decrease if you wait too long. Achilles tendonitis. As we age, our Achilles tendons become less flexible, because they begin to weaken. This form of tendonitis is a common sports-related injury not only in runners, but in people who play only on weekends. If you sustained sports-related ankle injuries, Dr. Alster has the skills and experience to help. She can explain how stretching orthotics may help prevent injuries in the future, and recommend a course of treatment that’s best for you. Don’t let sports related ankle injuries keep you out of the game. Contact the Family Foot & Ankle Center of Central Jersey to get started on the road to recovery. To schedule your appointment with a certified podiatric surgeon and sports injury doctor, please call us at (732) 851-1617 today!